Today, Casanova hits the stands. It's out and you can finally see it. Nothing will ever be the same again. 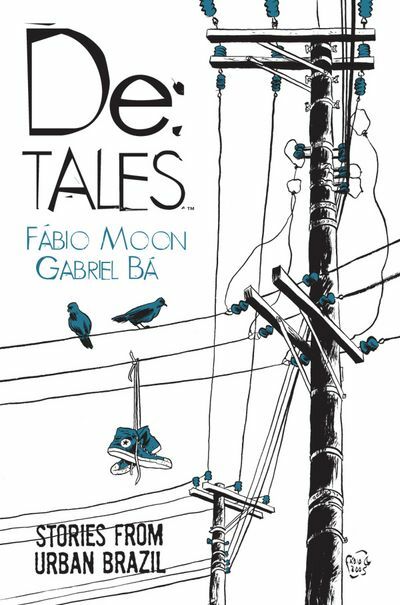 Tell us what you think of this first issue and, if you haven't seen De:TALES already, now it's your chance to go again to your comic book store and get your copy (and let us know what you think of it too). Warren Ellis seem to like it. It's funny to watch something from the backstage. It's not the same as doing it yourself, that would be the center stage. No, I'm just watching from a same distance, yet from very close, as pages and more pages of Casanova are made. Besides Ba, I'm probably the only one who sees all the pencils, all the thumbnails and all the sketches. I see stuff even Matt Fraction doesn't see, and he's the writer of the comic book. I see all the drawings Ba didn't like (even if they were great drawings) and erased. I see the whole thing. Today, Bá finished the cover of issue 5. Today, I'm also doing a cover. It has to be done by the end of the weekend, so I still have a lot of work before me. I'm only doing sketches today. And now Ba is at the backstage, watching me as I go. Yesterday was a great day. We're now thirty. We're now old. I don't feel old, really. I have more energy than ever, as so many stuff is happening. For starters, we just got this on the mail. We also received another package in the mail, the same day, as if they all knew. De:TALES comes out on wednesday. Because of that, I'll write something about some of the stories, and why this book exists. I think that personal contact is important when you're trying to sell your work, your story and your art, but the story is, in the end, the most important point of the equation. No matter how many conventions I go, how many editors I meet, how nice or good looking I am, it's the quality of my story that will get the job done. My brother and I had met Diana Schutz when we finished Roland, as we gave her a copy of the story for her to read - and then for her to give to Frank Miller, who had also just finished 300. That was back in 1999 or 2000 (my brother remember these things better than me, but anyway). A year later. we had Ursula to show, and she noticed how much better the art had gotten, but since it was only the artwork we were showing, the conversation could go only so far. Back in Brazil, in 2001, after meeting her and so many other editors, we started working on other stories, and trying to come up with more serious ones. At the time, we were contributing to an brazilian anthology, and we focused our efforts into stories for the anthology. Out of that effort, we did Late for coffee. I'm very proud of that one. It was probably the only time we completely divided roles, as I wrote everything without Ba's help, and he then drew the entire thing himself. We talked a lot during the process, which is one of the advantages of working side by side at the studio, and we found the best angle for every scene. She had read it, and, aside from how much the art had improved, she was impressed about how much she liked the story. That's the most important point of the equation, in my opinion. But the art in this story is one of the most beautiful things Ba have ever done. Makes you want to fall in love and makes you want to cry. If you click HERE, you can see the Dark Horse page for our beloved upcoming De:TALES, and I just noticed it contains a four page preview of our first story. The book is coming out next week, and from there on, nothing will ever be the same. We have been working with Diana Schutz to get this book out since 2002, so most of the stories we did since then are on the book. Now, with the release of the stories, we have only an open road to travel, in which new stories (yet un-written and un-drawn) will emerge.